file Don't download that! You don't know where it's been! My original plan fer this page was ta review the different files available fer download for the game, such as the patches and Lawmaker. But that's kinda borin'... let's do somethin' else! Here's a file for ya! If ya didn't get my font pack offa the first page (shame shame) yer probably wonderin' why this site looks so damned ugly. In fact I'm surprised ya lasted this long. Well don't waste another minnit, get those fonts now! Make sure yer version of Outlaws is up ta date with th' latest patch. I ya ain't got th' game yet an' aren't sure it's worth th' investment, get a taste of real Outlaws gameplay with th' downloadable demo. Get better multiplayer gameplay with this extensive list of Windows internet tweaks, tips and utilities. Charts, screenshots and commentary illustrating the differences in Outlaws performance between DirectPlay, MGL and 3dfx Voodoo, Voodoo 2 and Banshee. If you've got a Voodoo card, don't miss the list of tweaks that may increase your framerates by as much as 60%! Now with two critical files needed to get Outlaws lookin' like it should for Banshee users! Whaddaya think -- this page has some extremely handy programs ya kin download ta get yer system up ta snuff fer facin' down those really mean varmits out there. Like a Glide wrapper to run Outlaws in Direct3D, drivers fer gettin' that third mouse button workin', a Spaghetti Western Doom2 add-on fer diehard Sergio Leone fans, custom Outlaws crosshairs and hacks and the NWX Editor fer all yer Outlaws sprite editing needs, among other goodies. 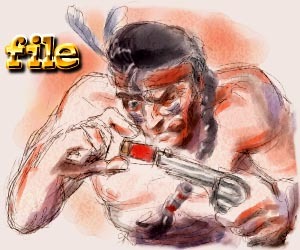 Check the petition for an Outlaws sequel that ran on this site. You can also check out ideas from myself and other readers for what to put in a sequel; if you have some ideas send them in and I'll add 'em to the Outlaws 2 Wish List. And finally in a slightly different vein you may be interested in my Sketch for a "Realistic" Western Shooter which incorporates some of the ideas I had for an Outlaws sequel into a rough draft of a very different type of Old West game. If you're currently using the DirectDraw Outlaws video drivers you may get a big performance boost by switching to the MGL drivers hidden on yer Outlaws CD. MGL boosted my Outlaws framerates by 300%! Can you say "169 frames per second" without a 3D accelerator? YES you can: MGL! Well ya kin have th' best video card an' monitor around but they won't do ya a lick of good if ya got 'em set up all wrong. This here's yer simple guide ta settin' yer card gamma an' calibratin' yer monitor fer maximum Outlaws visual happiness. Th' most comprehensive compendium of Outlaws "cheat" codes around, unless somebody copies it from me. Vary yer Outlaws play with some pretty wacky effects. There are nearly 500 different audio files in Outlaws that you kin activate during gameplay to dazzle and annoy yer friends. Want to bark like a dog? Moo like a cow? Let rip with a crazy, gibbering scream? Make fun of yer buddies in more than a dozen different dialects? If so then this's th' page fer you. I try ta post a new Outlaws screenshot every day. If you've got a shot, send it in an' there's a good chance I'll post it -- saves me th' trouble of havin' ta come up with shots on my own. Jus' follow th' few simple guidelines on this page, an' yer name an' masterpiece could by up on lights on this site. Once ya get used ta WinNT it's hard ta go back ta 95. Even though it says it doesn't on th' box, Outlaws DOES work in NT. Mostly. In some respects it runs better than under Win95, but let's jus' say that I still keep my '95 partition around fer playin' Outlaws. Check this page fer th' reasons why. Thanks to the beauty of modern software emulators you kin now play this great ol' game from th' Commodore 64 days on yer PC. Mosey through th' streets of a small western town, dispensin' justice an' barbed insults as only a sarcastic sheriff can. Jus' about everyone an' their uncle are packin' heat in this classic adventure. Download it today! Jus' th' contents of my "file" directory on my anonymous ftp server, ftp.paleface.net.